Buy Nadia Francis a Coffee. ko-fi.com/nadiainprogress - Ko-fi ❤️ Where creators get paid by fans, with a 'Buy Me a Coffee' button. Use Ko-fi to support the artist through small donations the the amount it would take to buy a coffee. Nadia is a sculptor currently exploring the body through meticulously sculpted dolls. Each doll is an articulated and movable work of art, made of over 20 segments she sculpts and cast by hand. 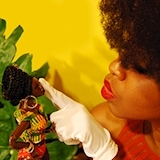 She focuses on the Black female body to uplift and celebrate Black womanhood. Secured Payments. Support goes to Nadia Francis's account. Upgrade Nadia Francis to a yearly Gold Membership with a one-time payment.